I’ve really made no secret of the fact that I have my doubts about the long term viability of the PARCC test. Some of the sample items that have been released to the public are so difficult that they border on downright unfair. During my final 5 years as a high school math teacher, the math team I coached finished as the top public high school in Illinois in the 2A division each year, and there are items that I’m certain most of my math team students would have been unable to successfully complete. The roll-out of the test has been unnerving to those in the education profession, as it has been hard to get straight answers to the simplest of question: Which students will be tested and what years of school? What will the format of the test be? What will the PARCC calculator policy be? That last question particularly sticks in my craw for a couple of reasons. First, it should have been answered long ago, not heading into the final 6 months before a high stakes test was to be administered. Second, that PARCC officials were seriously considering an all out ban on students bringing their own calculators into the PARCC test is ludicrous. 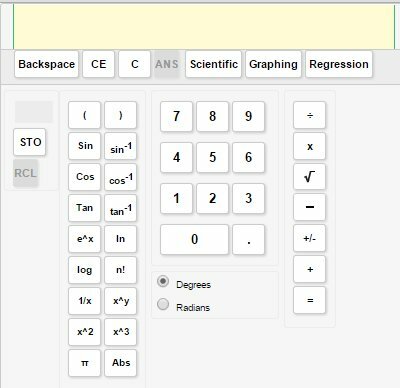 What’s the point in mandating a single calculator (web based) for the assessment itself when students have been using a variety of devices over their years of schooling? Providing a calculator built into the exam is a great thing, but mandating its use? Either design an exam that does not use calculators or allow students to bring whatever they are used to, subject the restrictions of the ACT or the SAT examinations, which have long standing, well accepted calculator rules. I’ve raised this issue on Tech Powered Math before, I’ve raised it within my school district, and I’ve raised it to the few officials I had contact with that have a voice on what the PARCC exam rules would ultimately be. It seems as though common sense prevailed in the end, probably because there were other voices speaking out just like mine. When PARCC rules were finally unveiled in October for this Spring’s first round of examinations, the rules did allow for high school students to bring their own calculators, assuming they had capabilities “consistent to that of a TI-84 Plus.” Perhaps no one wanted to be accused of plagiarizing the ACT permitted calculator list, but I’m assuming that “consistent” to a TI-84 Plus means “ACT legal.” (You can check my list of ACT calculators here). For students and teachers, this is the right call by PARCC, although one that should have come much earlier. In a couple of conversations I’ve had with Texas Instruments officials, it’s been clear that they had been hopeful for this conclusion all along. I would assume that HP and Casio would feel the same way, as mandating a web based calculator would not be a particularly great thing for any calculator manufacturer, both for their business model and to their mission of improving education through technology. It’s worth noting that these are the PARCC calculator rules for 2014-15 only. It’s impossible to say if they could make a change going forward given their reluctance to allow student owned calculators to this point. I don’t know how PARCC might be influenced by what Smarter Balanced, their only real competitor on Common Core testing, is doing. As near as I can tell, no outside calculators of any type are allowed with Smarter Balanced. All that’s allowed is this primitive web based calculator. On the one hand, if they aren’t going to allow students to bring their own calculators, I appreciate them not favoring one platform over another. One concern I would have had about PARCC making their online calculator exclusive is that it closely mirrors the TI-84 Plus, which would have put TI-Nspire, HP and Casio students at a disadvantage on the exam if outside calculators were not allowed. On the other hand, the Smarter Balanced calculator is pretty limited with a really clunky interface. I guarantee there are going to be teachers wasting valuable instructional time reteaching their students how to use this calculator prior to the exam. I saw a first hand example of this recently when I attended a nice webinar put on by Texas Instruments designed to help teachers to prepare students to use these online testing calculators. For teachers getting ready for the PARCC exam, part of the webinar explained how TI-Nspire schools/teachers could get their students ready for the online TI-84 used by PARCC. For Smarter Balanced states, one piece of advice that was given along the lines of: “Be sure to spend time teaching the students how to do complex fractions horizontally with parentheses and a division sign if they are used to working vertically with fractions.” I mean, this is actually really good baseline advice for preparing students, and it’s the same kind of advice I’d be giving if I were teaching the webinar, but can we really argue that this is the best use of instructional time? (For further information, I do recommend taking a look at TI’s page on the TI-84 for online exams). My own philosophy heading into the PARCC, when I believed I would still be teaching when it launched, was to not take it too seriously. The bar appears to have been set so high by this test that it is hard to lose much sleep over it. It seems as though support for the test is rapidly collapsing. From a high of 23 states in 2010, by early 2015 the number of PARCC states has dwindled to only 10, and that’s prior to a real administration of PARCC testing. My own state of Illinois won’t pull the escape lever so easily, having signed a 5 year contract to administer the test that culminates in a maximimum $160 million payment due in the summer of 2018. A showdown is currently underway in Chicago between the Illinois State Board of Education and the Chicago Public Schools, where a number of schools are balking at administering a PARCC test that they don’t feel has been properly vetted. From my classroom several months ago, and from my blog cave today, it seemed unlikely that the PARCC test would survive much beyond its initial round of contracts. Classroom teachers have limited time, energy, and stress reserves to devote themselves to learning about standardized test preparation. It seemed more logical to me as a high school teacher to invest that time in exams like the SAT, ACT, or AP examinations. While those exams are not perfect, a good performance there has clear value to a student who has college goals in mind. They have also been around for decades, and are unlikely to go away anytime soon. The PARCC exam? The view from the year 2015 is its future is a lot less certain.